The WWE Royal Rumble is an annual pay-per-view live professional wrestling event that takes place in January. Since its debut in the late 1980s, the event has become one of the most viewed and popular ones in the entire roster of the WWE. The Royal Rumble features many of the biggest names in American professional wrestling who go head-to-head in an adrenaline-fueled and chaotic elimination-style match. Now, the event is back for another year, much to the delight of eager fans, who are sure to be lining up for their WWE Royal Rumble tickets . Tickets for WWE Royal Rumble are currently unavailable. The Royal Rumble is one of many events of its kind by the wrestling promotion giant World Wrestling Entertainment (WWE). The company was created in the early 1950s as a professional wrestling promoter and has since grown into an entertainment and media empire. It is now the biggest and most recognizable professional wrestling promotion brand in the world, with more than tens of millions of viewers in America alone. Its events are broadcasted in numerous languages in well over a hundred countries. Aside from its flagship product of professional wrestling entertainment, the company also has such widespread interests as film and music. As part of its efforts to expand its line-up of events, the company began the WWE Royal Rumble in 1988 as a live arena match. The Royal Rumble was originally broadcast as television special but became an instant hit and was immediately picked up for another year. Thereon, the event was rebranded and promoted as an annual pay-per-view occasion. It is now considered one of the WWE’s iconic "big four," a collection of the company’s biggest and longest-running annual pay-per-view events. As an event, the format of WWE Royal Rumble is very versatile. It is based on the classic Battle Royale layout and features a total of thirty wrestlers going against an elimination match. However, the wrestlers do not enter the ring all at once but are, instead, given entry numbers by way of a lottery. Some numbers are deemed more desirable than others and contestants can get these spots by winning a specific match before the Royal Rumble competition. The wrestlers who draw - or win - the numbers one and two start the match. After that, each of the remaining participants enters the ring according to their assigned entry number after regular intervals of either one and-a-half or two minutes. According to the rules of the match, each wrestler must try to eliminate his opponents from the game by throwing them over the top rope of the ring. Furthermore, the contestant being eliminated must have both of his feet touching the floor outside of the ring to be disqualified from the match. These specific stipulations are the only ones that guide the competition but are, nevertheless, very strict. This is especially true of the over-the-top-rope rule and any wrestler who is not thrown out of the ring in the specified manner is not eliminated. This has resulted in interesting incidents, such as in 1999, when Steve Austin and Vince McMahon left the ring without going over the top rope. They were not eliminated and were able to return to the match later on in the evening. In addition to this, a Royal Rumble competition can even end a tie. The most notable occurrence of this was in 1994, when Lex Luger and Bret Hart were both declared winners after it was determined that both of their feet touched the ground at the same time during elimination. The Royal Rumble is made even more interesting by the fact that the winning contestant can choose from a number of different championship titles to claim for himself. Said winner can go on to have a match at WrestleMania for a shot at the WWE Championship or a World Championship. And, starting in 2007, the winner of Royal Rumble can even choose to take a shot at the ECW World Championship. Needless to say, the WWE Royal Rumble is a thrilling event in which unpredictable outcomes, visceral thrill and stunning showmanship are guaranteed. It has all the hallmarks of a great live wrestling match: several opponents in a raw, no-holds-barred match in a singular ring, ferociously demonstrating their skill and fighting prowess in their attempt to emerge victorious and glorious. All of this while being surrounded by thousands of spectators, cheering and screaming from the stands for their favorite contender. Eager fans should get their WWE Royal Rumble tickets , which are now widely available. Kurt Angle, the Raw GM made a blockbuster announcement on the December 18, 2017 edition of the show. Brock Lesnar will now defend his Universal Championship in a Triple Threat match at the Royal Rumble. His opponents will be Kane and Braun Strowman. Strowman and Kane collided last week to determine who the number one contender would be but the match ended in a double count-out. Now Angle has made it a Triple Threat match and it all kicked off between the three participants when Angle left the ring. Lesnar first took our Strowman and then hit Kane with an F-5 before exiting the ring. Kane however sat right back up before the champion could reach the back. Currently the average price for WWE Royal Rumble tickets is $102. The date and location for this event is 27-Jan-19 at Chase Field, Phoenix. The minimum get-in price for WWE Royal Rumble tickets is $18. Q:How can I pay for my Wwe Royal Rumble San Antonio Tickets? A:The Wwe Royal Rumble Tickets you see on our website have been put up there by our brokers and they accept payments made through credit cards only. Q:What will happen in case I lose my wwe royal rumble 2019 tickets or they get stolen? A:Please understand that your Wwe Royal Rumble Ticketss are a one of a kind, irreplaceable item and as such, cannot be reissued or reprinted easily. Therefore in case they are lost, as per company policy, you will have to buy new ones. This is done to keep a check on fraudulent re-printings of the same tickets. So please keep your event tickets in a safe place until you have to use them. Q:Where can I find information on wwe royal rumble showtimes? A:If you visit the Wwe Royal Rumble Tickets page on our website, you will see that all the tickets are accompanied by the date, time and name of the venue. So you can easily check the show time for the event from there. Q:When will I receive my wwe royal rumble wrestling tickets? A:Your Wwe Royal Rumble Tickets are shipped to you via FedEx, and it depends on them as to when they are able to deliver the tickets. For our part, we usually place orders on the same business day as they are received, or the following business day, if they are received after hours. But please rest assured that your tickets will reach you well with in time for your event, for FedEx is a reliable courier service, and is guaranteed to deliver your tickets as soon as possible. Q:Are WWE Royal Rumble Tickets for sale on your website? A:Yes, Wwe Royal Rumble Tickets are already available and being sold at our website. Simply visit the event's page on our website and browse the list of available tickets. In case tickets are no longer available, you could leave us your email information or contact details and we would be happy to get back to you to let you know if new tickets do become available. Q:Where is the best place to get WWE Royal Rumble Tickets cheap? 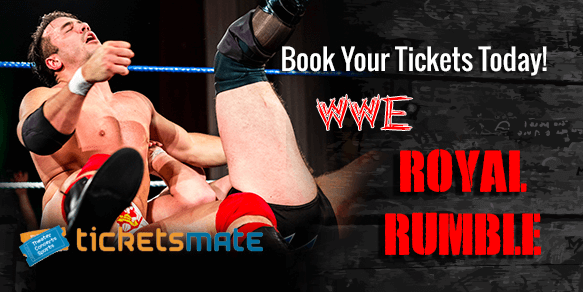 A:You can easily get cheap WWE Royal Rumble Tickets at our website. Sign up to our newsletter and get Promo Coupons which you can utilize to get even more discounted tickets. Q:What is the price range of cheap tickets wwe royal rumble? A:The price range for Wwe Royal Rumble Tickets is given on our page. Check the details and place the order before it is too late.